This morning I kept thinking about the perfect gift and considering this book review. What could I write in cacophony of the Christmas season and the run up to this day? How to describe an excellent book and why one should buy it? Frankly, I have been stuck, but this morning when I thought that my perfect gift was my happy daughter playing with a new toy and my husband’s nose buried in a new book, I was reminded that time spent with family is the perfect gift. And so in the quiet moment as I picked up wrapping paper, I realized what is so unique about Mom, Incorporated (A Guide to Business + Baby) by Aliza Sherman and Danielle Elliott Smith was how time with family—the control and management of it—is so carefully considered for mothers who want to create a business...a business that makes money and meshes into the life of motherhood. No less time is spent as a mother working from home in a business she has created than working for a company, but the glaring difference is autonomy. The autonomy to prioritize one’s own time—particularly time spent with family, in the service and care of children. What is so helpful, is that the authors, who are both mothers and their experience, along with the other successful business owners interviewed in the book, who are also mothers is so spot on about how to actually manage work and motherhood. What is given isn’t a perfect formula, but rather realistic a plan that is borne from the fires of personal mistakes. What I have loved about Mom, Incorporated is that Sherman and Smith are like a cheerleading section in considering, creating and then running a business. Experienced entrepreneurs themselves they set out to create an “aha” moment for their readers—mothers of all varieties—and they do so over and over again. The first place that happened for me was right in Chapter 1: What Kind of Business Will You Grow? Sherman and Smith interview Carol Roth, a business advisor and they help the reader consider the difference between a “jobbie” or a hobby. Is one’s potential business endeavor “me-centric” or “customer-centric?” Wow, how many failed businesses needed to consider this issue. And here is what is so compelling about the book, the authors aren’t giving a lecture, they are teaching a seminar: through worksheets and questions—one should start a journal with this book—the authors guide the reader in the day dreaming phase of creating a business all the way through to promoting a business and everything in between from lawyers and accountants to insurance and work space—each topic is considered with enthusiastic realism. There is such a wealth of information and insight captured in this book that it is hard to do it justice in a book review. Buy it. Read it. Through out the book Sherman and Smith have a writing style that is inviting for any mother (or potential entrepreneur), which champions the underdog self that is riddled with doubts. Reading each and every chapter, which I did, the reader can see how to build long range success into a solid business venture that makes money. I have been a business owner myself, both running a design studio and an art gallery in New York City. I learned a tremendous amount and made a lot of mistakes in doing both those endeavors and so it is through the lens of those experiences that I read Mom, Incorporated. Also I am considering starting another business with my husband over the next year. At the end of each chapter I would think of someone who I thought would really benefit from reading this book. Frankly, this is the best “how to” business book for EVERYONE...even child-free individuals could also use this kind of cheerleading. Many potential business owners could be shepherded toward a long-term successful business since a stable foundation is so beautifully mapped out step by step. 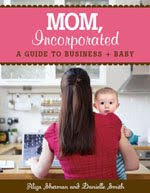 So, during this quiet week between Christmas and the New Year let the little whisperings that beckon for change find fruition: buy this inspirational book—Mom, Incorporated (A Guide to Business + Baby) by Aliza Sherman and Danielle Elliott Smith—and start yourself on the road toward making a personal dream come true. What a gift this book can be. You can have great success with excellent professionals guiding your way. Start that business and become the entrepreneur you were meant to be. Maureen~ Thank you, a million times over, for your thoughtful and kind words about 'Mom, Incorporated'. Nothing is more important to Aliza and I than to know our book has the potential to resonate with both mothers kicking their businesses in to gear, and with those who are already in the midst of success, and are looking to create some peace in their home. We are extremely grateful.